"My friend, can I show you something?" The Turkish Education graduate student told me in Istanbul's airport, after I told him I was a political science professor. He took me to a voting place, right there a few gates away, for those flying out who might otherwise miss the biggest election in the country's nearly 100 year history. Giant clear tubs with a slit cut through the white plastic top that looked straight out of WalMart were filling up with green envelopes that looked like they otherwise held large Christmas cards, dropped in by Turks traveling to other countries. 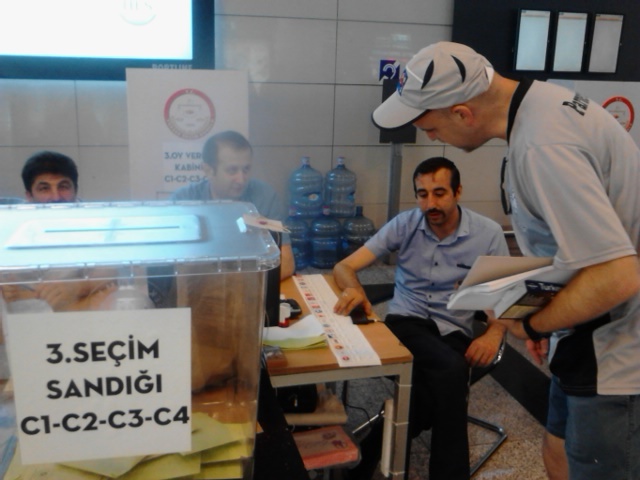 Here voting monitors in Istanbul's airport show me the balloting process. The monitors were all too happy to show the process to me, an American professor visiting to analyze the country's political process -- and why not? It's rare to see Turkey's election take such prominence on television and in print, not just in the country, but around the world. In an Amsterdam kiosk, nearly every publication from every country had a story about the election, the president, a political party or whether the votes in this Middle Eastern (or European) democracy would be counted fairly. One hundred years ago, there wasn't even a Turkey. The Ottoman Empire voted to go to war with the Allies, a decision that is often attributed to a cunning pro-German leader (Enver Pasha) than the will of the population, which often teamed up with Britain against Russia in the Balkans. 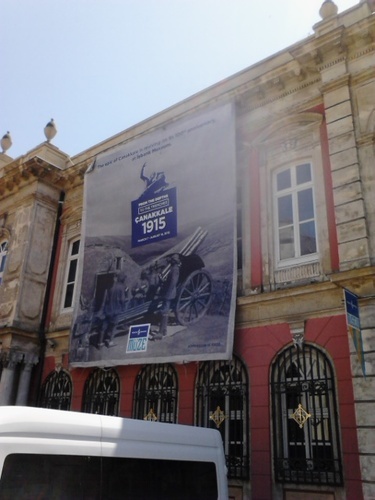 Despite success at Gallipoli (see the Mel Gibson movie for details), the Ottoman Empire was on the losing side, in danger of being broken up by the victors. A Turkish Museum commemorates 100 years of World War I for the Ottoman Empire. But General Mustafa Kemal Ataturk thwarted those plans, rallying the people to defeat a Greek invasion in the early 1920s. Kemal Ataturk's mission was to build a Turkish identity and to construct a Western-style country, complete with a compatible culture and a republic. Yet his autocratic style didn't always lend itself to liberalism. Moreover, his secular vision never quite eliminated Islam, which has returned in a big way. Bouts of a two-party system, military coups and multiparty chaos with at least a dozen political combatants followed Ataturk. But now, the current leader, Recep Tayyip Erdogan, seeks a presidential system that would resemble the French regime with its potent presidency, wielding power George W. Bush or Barack Obama could only dream about. And the election is about whether his powerful party, the AKP, will get the ability to change the constitution to create such a system. There are almost as many streamers with political flags as telephone wires in the USA, and more political posters than billboards. 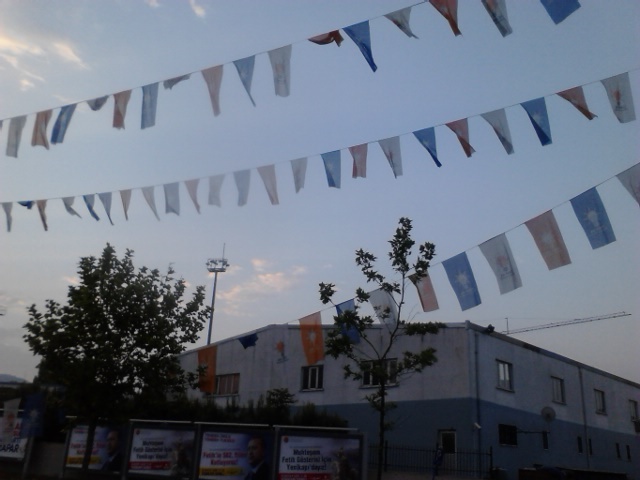 "Erdogan seeks to remake the country in his own image," another professor told me on the trip. "And that's too much." Talking with Turks, I noticed fears of vote fraud. Maybe that's the reason for the clear bins for all to see, instead of wooden boxes. But it's not the only factor on people's minds. According to Slate, Tammany Hall boss William Marcy Tweed once said, "As long as I count the votes, what are you going to do about it?" When talking with the Turks, I noticed that women were more optimistic than men, and younger people were more into the political process than the older people, who probably remember coups and canceled elections. "Let's not spend all of our time talking about democracy," one young female voter said. "Let's vote!" John A. Tures is a professor of political science at LaGrange College in LaGrange, Ga. He can be reached at jtures@lagrange.edu. The names of many people I interviewed are not included, in case there is any subsequent political intimidation.